After using it for about 3 months I am not even half-way done! My hair is very dry, frizzy, unmanageable, and it is color treated as well. I usually dye my hair every 3 months or so. When it comes to very harsh hair processes, I don't bleach or highlight my hair at all. I just stick to one overall dark hair color process. This mask contains three natural extracts-Olive, Meadowfoam Seed, and Sweet Almond, and each work to help moisturize and hydrate the hair from root to ends. Olive is used to "penetrate to the center of the hair, Meadowfoam Seed helps moisturize the middle, and Sweet Almond wraps the surface". When washing my hair, I use my Head And Shoulders Shampoo (I don't have dandruff really, I just like head and shoulders because I feel like it really helps keep my hair and scalp very healthy. 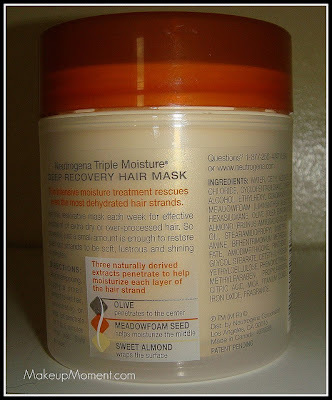 Other shampoos I have tried always seem to make my scalp feel dry and itchy-I decided to stick with what works for me), then after shampooing I take about a quarter sized dollop of the Nautrogena Triple Moisture Hair Mask and start applying it to my hair from hair shaft all the way to the ends, where I make sure to really concentrate the the product as my ends are very dry. I don't apply this hair mask to my scalp because the top part of my hair can get oily really fast, so I just leave the top scalp alone when it comes to applying hair treatments and such. I then clip up my hair and leave the mask on the hair for about 5 minutes while I finish the rest of my shower. 1. The scent is amazing! It smells very clean and fresh. The smell even lingers in my hair a bit after I finish styling. 2. A little bit goes a long way when it comes to this hair mask. I apply a quarter size amount as I have a lot of hair, but if you have shorter hair I am sure you can get away with even a little bit less than a quarter size. Don't let the size of this 6 OZ tub fool you, this mask lasts a good while. 3. As I am rinsing the product out of my hair after 5 minutes, I immediately feel the softness and effect of the mask in my hair. While combing through my hair, I also noticed that it is so much easier to de-tangle as well. 4. When blow-drying and flat ironing my hair, I noticed that the end result leaves my hair more shinier, frizz free, and healthy-looking. I was very impressed when it came to my hair ends. They look super shiny, smooth and healthy! 5. Very affordable, and readily available in most drugstores. 1. I just have one gripe with the product-the jar packaging. I wish this mask would come in a squeeze tube because this jar can be quite a character while trying to work with it in the shower. The tub can be slippery and fall in my shower, and bits of water can often get in the jar as well. But, I guess I can overlook that little factor as I really like this mask. I am very happy I picked up this hair mask from Neutrogena and I recommend it for those who have dry damaged hair. I don't recommend this hair mask if your hair is very fine seeing as I think it would weigh the hair down a bit. 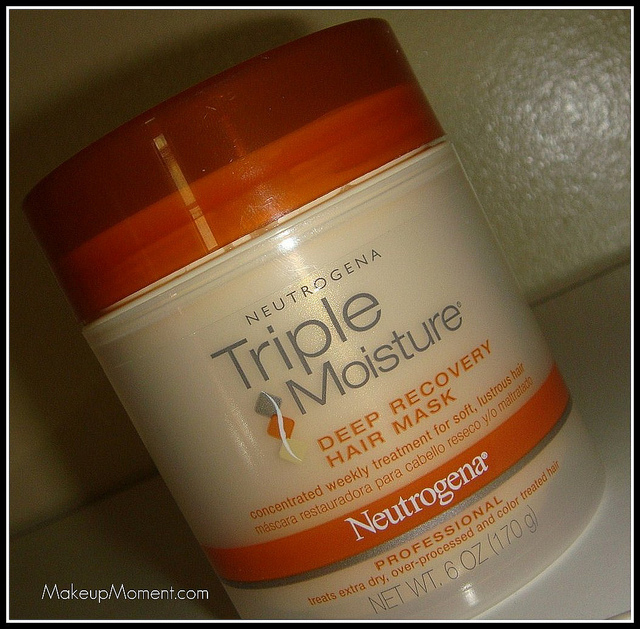 Have any of you tried this hair mask from Neutrogena? Let me know what you all think of it! I am sorry to hear that Dominique :( Maybe you can find some retailers online who have it available :) This is one hair mask I could not be without! I forgot all about their hair products. I have used them in the past and really liked them. Now I'm going to have to go get this product, lol. Thanks for posting. My hair is dry and unruly as well. I'll keep my fingers crossed this works. LOL! 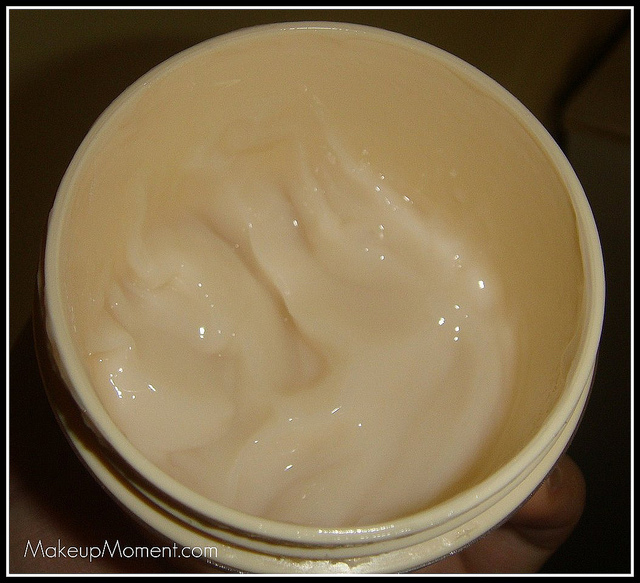 I hope you fall in love with this Neutrogena mask all over again :) It works, and it does not cost a fortune! Love!